Dating from around 1770, this rich coloured piece of storage furniture with original brassware would have been originally used for horse blankets and other riding equipment. Inside, the two small drawers conceal a secret storage compartment. Repairs have been made over the years, including the replacement of the bracket feet. 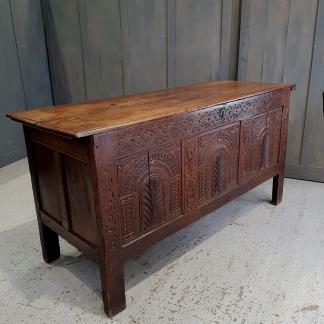 Please Note: For large items including this Mid Georgian Antique Oak Mule Chest With Secret Compartment delivery can take between 1 – 3 weeks for most parts of mainland UK. Further information on the delivery of our goods can be found on our delivery details page.